My oldest sister Guin was married in the summer of 1977. Her live-in boyfriend had just gotten word that he was being transferred to Texas and if they were married, he would receive a bigger financial bonus. That was that. Now Guin was not just getting married, but also relocated, uprooted, disconnected. In a whirlwind of activity, planning both wedding and the move, finding empty boxes to fill, ordering flowers, cancelling ConEd, getting blood tests, so many details. Guin’s bed became her office, the clunky dial-up phone tethered her to this location. In the swirl of changing environments and possibilities, she had uncharacteristically and drastically changed her hair style. From the straight haired pageboy to a Barbra Streisand-like blonde afro. Even our mother didn’t recognize her. But Guin had no time to defend this alteration, her to-do list seemed to get longer all the time. The wedding and the moving blended together like the vanilla and chocolate custard ice cream as it softly filled the waffle cone. The weather was hot and humid, the sheets in disarray, stacked with maps and guide books, wedding magazines and moving company brochures. I was the youngest of the three girls and had always admired my sister’s independence, she was always the first to go, always leaving a void in her wake. 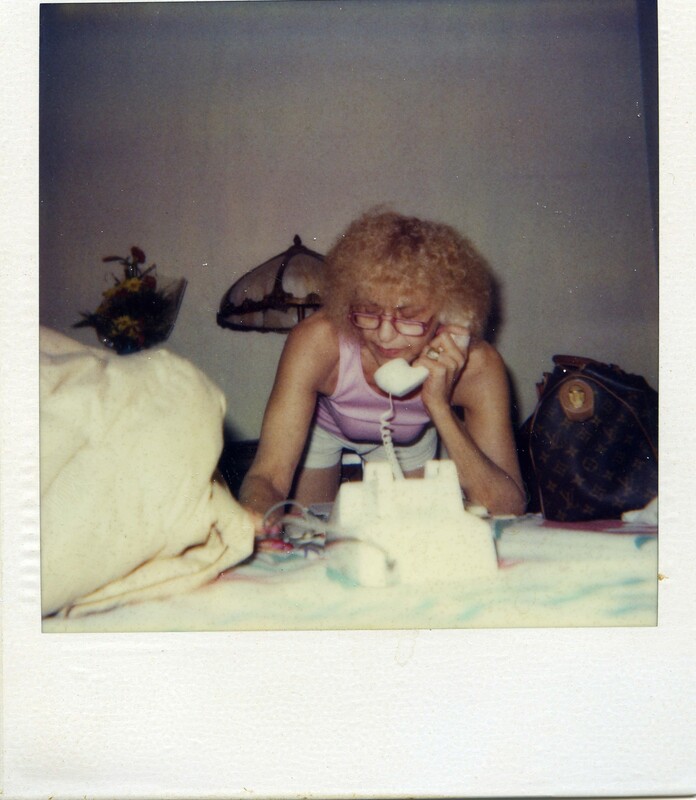 As I sat cross-legged on her bed, I snapped this photo of her talking on the phone but standing beside the bed in her lavender tank top and white shorts, making airline reservations and looking as if she would dart out of the room at any second. As I waited for the picture to develop, vision blurred by sudden tears, I picked up the bird guide book that Guin liked to consult. It was her life list and her wish list. I found the white-bellied go-away bird looking back at me from its African habitat. I knew then how much I’d miss Guin, and the years we’d spent in the Bronx apartment on Evergreen Avenue, when our hair was straight.